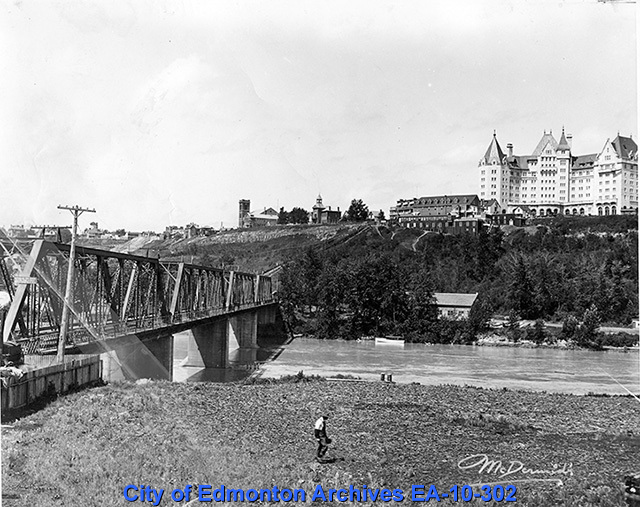 In the early 1900s Edmonton's river valley was quite different than it is today. Along with parks and homes, there were a number of large businesses and manufacturing plants operating in the area. 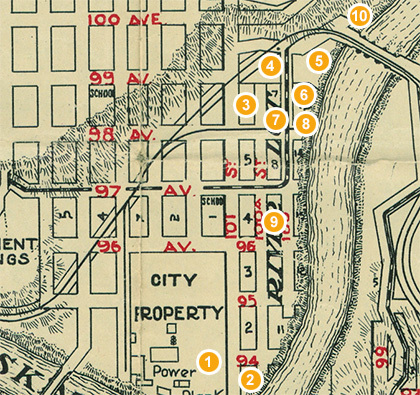 Use the interactive maps above to explore Edmonton's river valley as it was in 1915, shortly before the flood. John Walter arrived in the Edmonton area in 1870 and became one of the region's most prominent business leaders. His most successful operation was the lumber mill he established in 1893 on the south side of the river. After years of success, the mill began to suffer with the decline of the housing boom in 1912. During the 1915 flood Walter's lumber stocks and sawmill were washed away. The business never recovered. Pollard Brickyard was started by brothers John and Frank Pollard in 1898. The brickyard suspended production in 1913, and finally closed in 1915 after the flood. 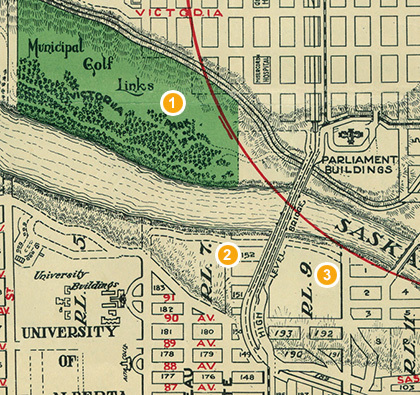 The Municipal Golf Links was Canada's first municipal course when its seven holes were unveiled in 1907. 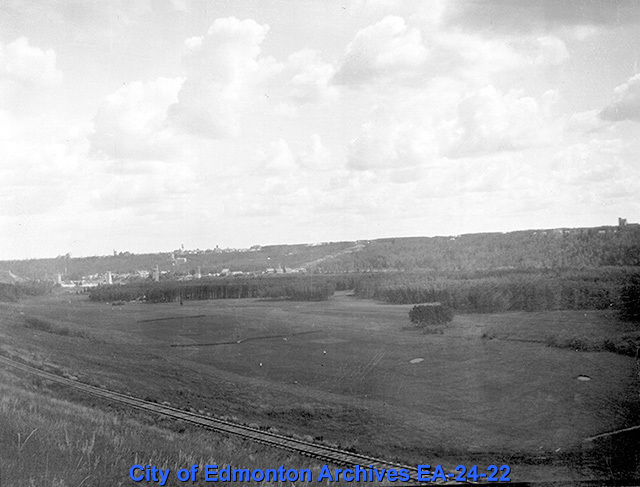 The land was leased by the City from the Hudson's Bay Company until the City purchased it outright in 1912, at which time the land became a municipal park as well as a golf course. Edmonton Brewing and Malting Co. The Alberta Motor Boat Company was established in 1911 by James Weir and James Buchanan. They manufactured a wide variety of boats that plied Canada's northern waters. After the building was destroyed by fire in 1948, the business relocated to the west end. The Arctic Ice Company was established in Edmonton in 1900. 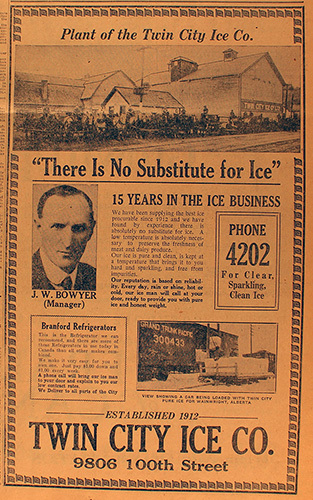 Prior to widespread refrigeration, ice was cut from the North Saskatchewan River and delivered to homes and businesses to preserve food. 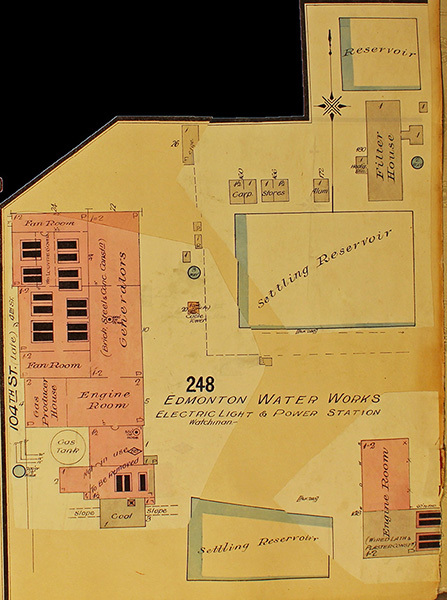 In 1913 the Arctic Ice Company took over the Edmonton Ice Company warehouse on Ross Flats. The building was sold to the City and demolished in 1978. 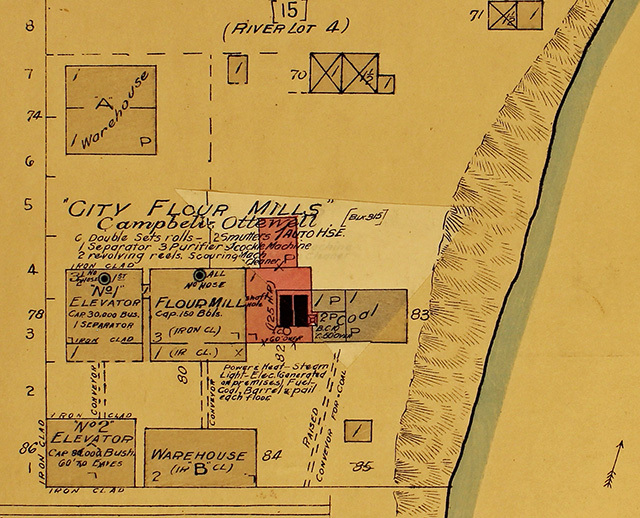 The City Flour Mills were built in 1899 by the Dowling Milling Co. In 1906 the business was purchased by R. P. Ottewell, with A. B. Campbell as manager. The company milled wheat into flour, and the elevators had a capacity of 110,000 bushels. 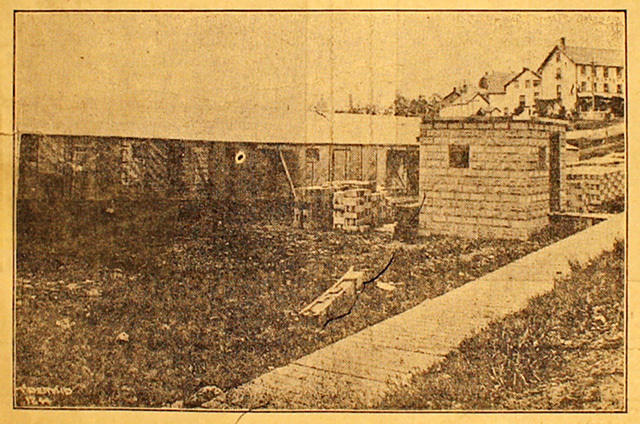 The business survived the flood, and was last listed in Henderson's Directory in 1921. In 1922 the property was listed as vacant, and by 1925 the elevators had been demolished. 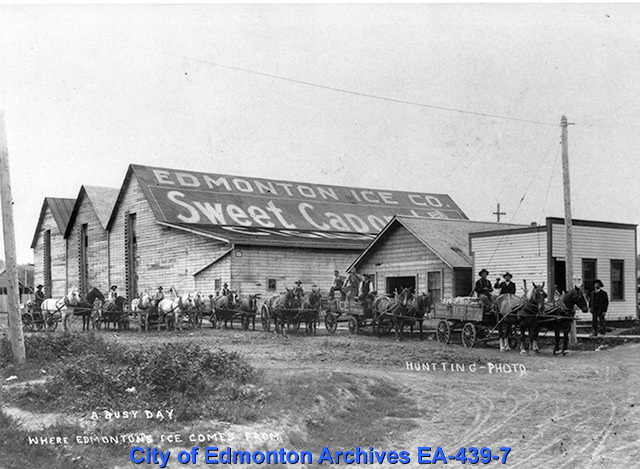 The Twin City Ice Company was established in Edmonton in 1912. 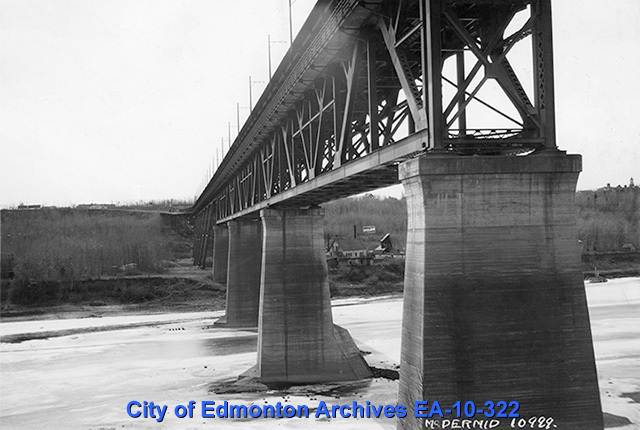 Prior to widespread refrigeration, ice was cut from the North Saskatchewan River and delivered to homes and businesses to preserve food. William Sheppard built this brewery in 1905. 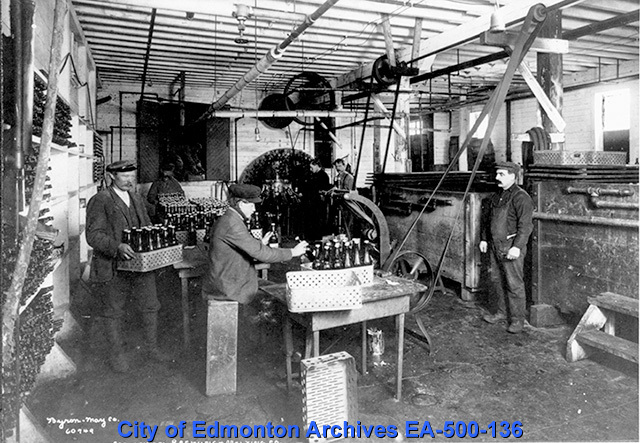 The Edmonton Brewing and Malting Co. operated here until 1913, when they moved to a larger space, using this building as an ice house until the 1920s, when it was purchased by Sicks Brewing Company and refitted once again as a brewery. James Huff established the Huff Grading Company in 1906. He used a large dredge on the river to scoop up rocks and gravel from the riverbed, which were then crushed and washed at his plant on shore. The business survived the flood and continued operating for several decades. 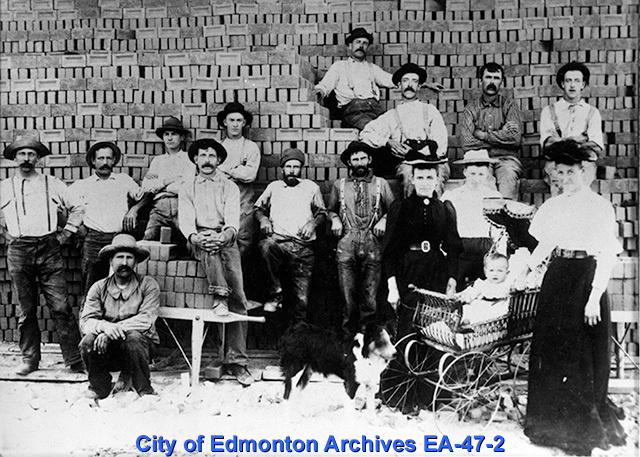 Edmonton Cement Products Ltd. was established in 1912, and specialized in producing building blocks. These were easy to use, inexpensive to buy, and provided good insulation at the time. After only a year in operation, the company had a capacity of 800 blocks a day. Diamond Park was built in 1907 on land leased from Donald Ross. 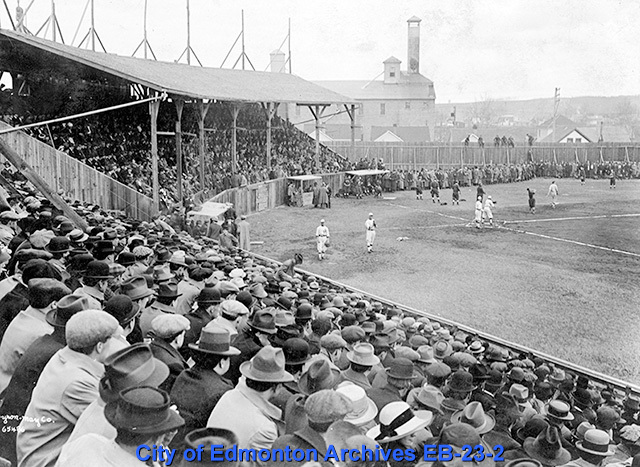 It played host to sporting events such as baseball, soccer and rugby games, as well as the Edmonton Exhibition. The bleachers were torn down in 1936. 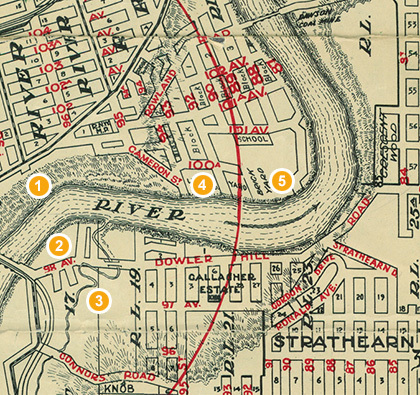 Prominent Edmonton businessman John Walter owned a very profitable saw mill on the south side of the river. Around 1900 he established a second mill across the river in Ross Flats. Both operations were destroyed during the 1915 flood. 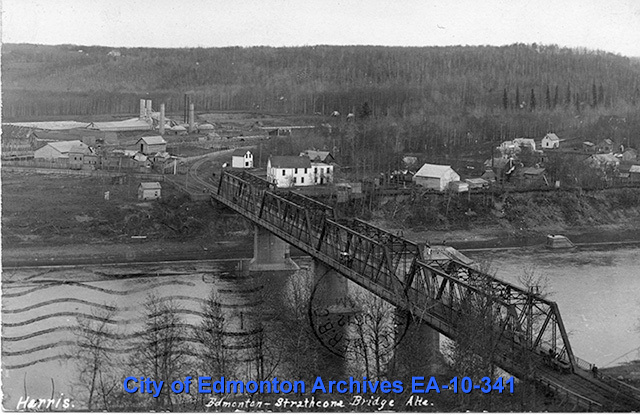 A new electric light plant was built in Rossdale just east of the Walterdale Bridge in 1903, with additions made in 1906 and 1908. 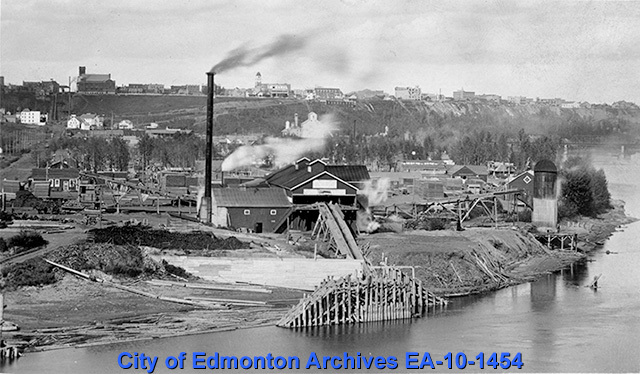 The power plant provided power for Edmonton's citizens and industries 24 hours a day. 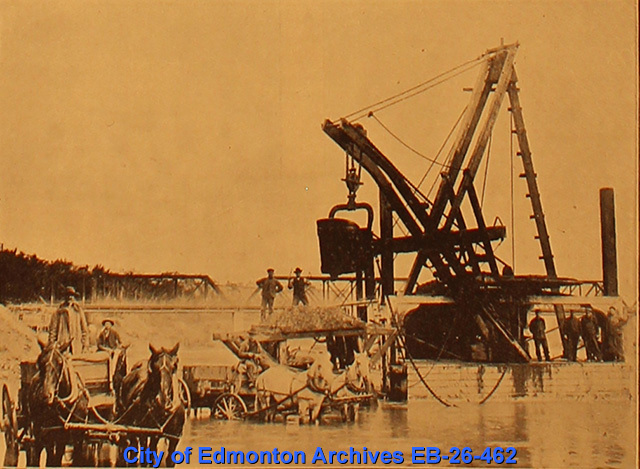 The plant also provided power to the Edmonton Water Works, which pumped water from the river, filtered it, and supplied it to homes and businesses in Edmonton. John B. 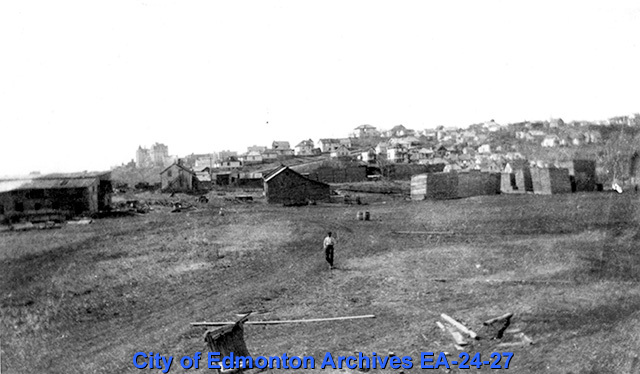 Little came to Edmonton in 1892 and started a brick making operation on River Lot 20, in present-day Riverdale. The brickyard produced bricks almost continually until 1956. Daniel Fraser and Richard Hardisty established a lumber mill and grist mill on Fraser Flats in 1881 under the name Hardisty and Fraser. In 1889 the name was changed to Fraser & Co., and the business was incorporated in 1904. The steam power mills had a capacity of 50,000 feet of lumber in a day, and provided seasonal employment for between 60 to 70 men. D.R. Fraser & Co. Ltd.
Pete Anderson owned a brickyard on Gallagher Flats between the present-day Muttart Conservatory and the Low Level Bridge. Production began in 1901 and continued until 1914, when he ceased operations and went overseas to serve in the Great War. He resumed production in 1929, but closed the brickyard permanently in 1932. 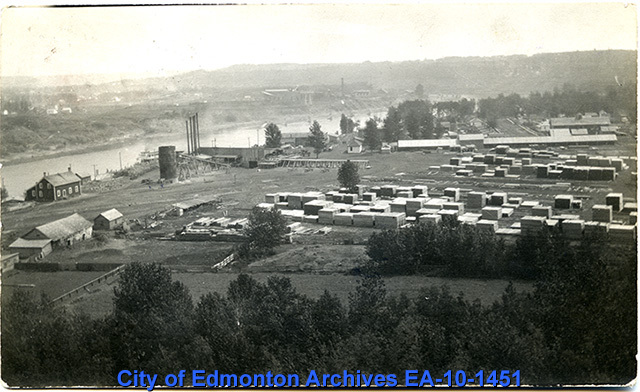 The Edmonton Lumber Company was located on the south bank of the North Saskatchewan River just east of the Low Level Bridge. Logs were driven along the river from lumber camps and processed at the site. A convenient arrangement that proved disastrous during the flood. Beginning in the 1880s there were a number of small coal mines in the river valley. Most were operated by one or two people, and did not last long, though there were some larger operations as well. 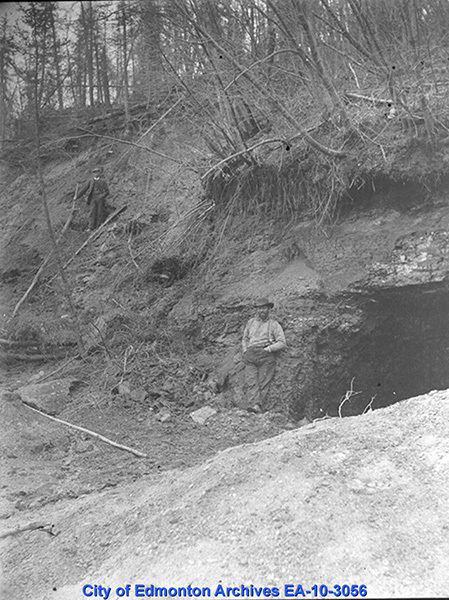 By the 1910s almost all of the mines had closed, as companies moved upriver to exploit the Clover Bar seam, near Beverly.